You need to be a new subscriber to Spin Rewriter. If you have previously subscribed to their trial you will need to create a new subscriber’s account with new email and personal details. You also need to subscribe using our link below. Sign up for the free trial by using our link on the banner below. Once the trial period is over sign up for the monthly plan OR the yearly plan (70% off the 12xmonthly plan). Once done so, forward us your payment to info[at]impromocoder[dot]com and we will give you back another 15% of whatever your first payment to Spin Rewriter subscription is (monthly, yearly or lifetime), straight to your PayPal account! You need to send us a PayPal email account as we rebate only to PayPal, no matter by what means you purchased your subscription. This offer is exclusive to IMPromoCoder.com loyal customers, and it is based on trust. In case you decide to cancel your Spin Rewriter subscription within the cancellation period, kindly return to us the rebate as well. 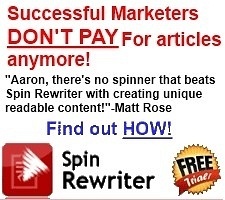 Though this offer is ours only, you still get Spin Rewriter’s full tech support and unlimited updates, even though you purchased the subscription with this substantial discount. That’s all! Go ahead and enjoy this Spin Rewriter discount promotion – up to 75% off! I bought Spin Rewriter and completely forgot about the rebate until a month later. I sent the email & received the rebate one day later. Thank you. I was skiptical about rebate code for Spin Rewriter. After my order I sent the receipt and the following day I got my rebate. Awesome…!! Received rebate as promised! Great communication and fast payment; Definitely recommended! hi,do you still have rebate for this product – spin rewriter 4 ? If you still have, send me an email to confirm, i will buy with your link. Hi John, yes our Spin Rewriter discount promo offer is still valid, you’re welcome to take advantage of it. Best of luck. I received rebate very fast, Thank you! Hey, Does this offer exists for new version(5.0)? Does it work for the lifetime plan too? Our Spin Rewriter discount is valid for all plans. Make sure to follow instructions as they are mentioned on the post, mainly making sure to clear browser cookies or use a new browser before using our link. I Got the rebate So FAST! Thank you for your WONDERFUL service! It is currently 15% of your purchase, that is, for the license you’ve asked about – $11.55 . Let us know if you have further questions or send them directly via our contact form. Awesome! I got my 15% back very quickly. This is a real offer and is the best! Do no hesitate to order Spinrewriter from here. I got my 15% as promised! Thank you! I sent a copy of the email showing the refund and within minutes I got the rebate back. He does exactly what he says he will and very quickly. I am sure if it had been in the middle of the night on a weekend it would have taken longer but that is understandable. Hi want to clarify, if I use impromocoder.com link, I get 75% discount or 15%rebate? You will receive from us the additional 15% rebate, on top of whatever discount/promo Spin Rewrtier currently has. I get my rebate really quick. In less than 24 hours, This guy already sent me the rebate. This software is fantastic and your generous discount/rebate is pretty slick, too. Thanks for being so responsive and quick to take care.